From left: Professor Mark Henrickson, Laura Sell and lecturer Paule Ruwhiu. The School of Social Work acknowledged three of their top students from the Auckland Campus at the Student Social Work Awards yesterday. 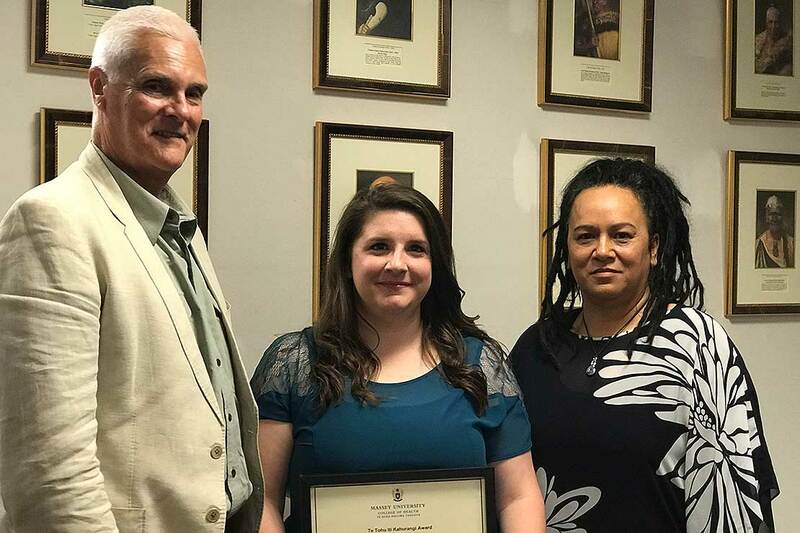 Laura Sell was presented with the Te Tohu Iti Kahurangi Award, which recognises high academic achievement, exemplary field education practice, cultural practice and resolving an ethical or values-related challenge during their study or placement. Unlike the other two awards given out, the winner of this accolade is nominated by fellow students, with 12 candidates put forward this year. Miss Sell, a third-year Bachelor of Social Work student, reflected on the support she has had from her lecturers during her studies. “There have been so many moments over the past three years where I have had so much encouragement from them. All those little moments of encouragement across the years mean so much to me. For you, they might just be a sentence, but to me they are really valuable,” she said. Miss Sell was awarded $500. From left: Dr Moses Faleolo, Nicola Irwin and Dr Hagyun Kim. 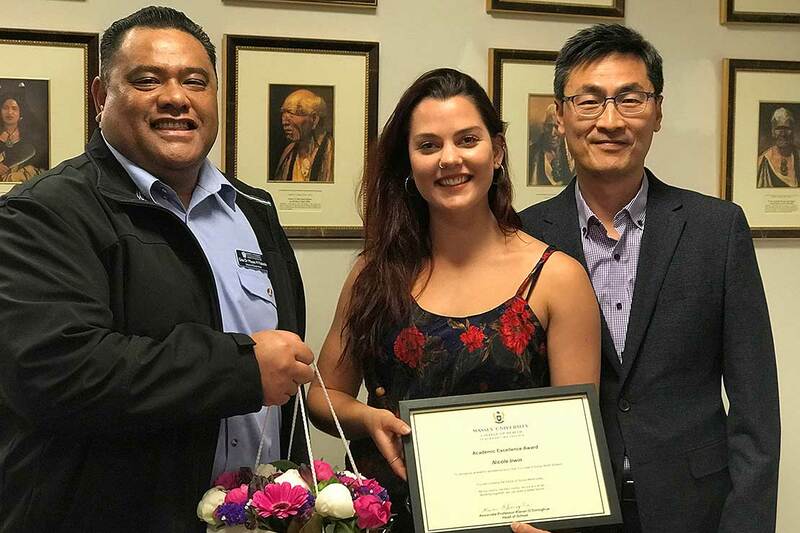 Fourth-year Bachelor of Social Work student Nicole Irwin was awarded the Academic Excellence Award, which recognises academic excellence by a third or fourth-year social work student. Nominations for this award were sought from Auckland campus Social Work and Social Policy staff. Miss Irwin was awarded $250. From left: Associate Professor Ksenija Napan, Kalayvani Perumal and Lynsey Ellis. 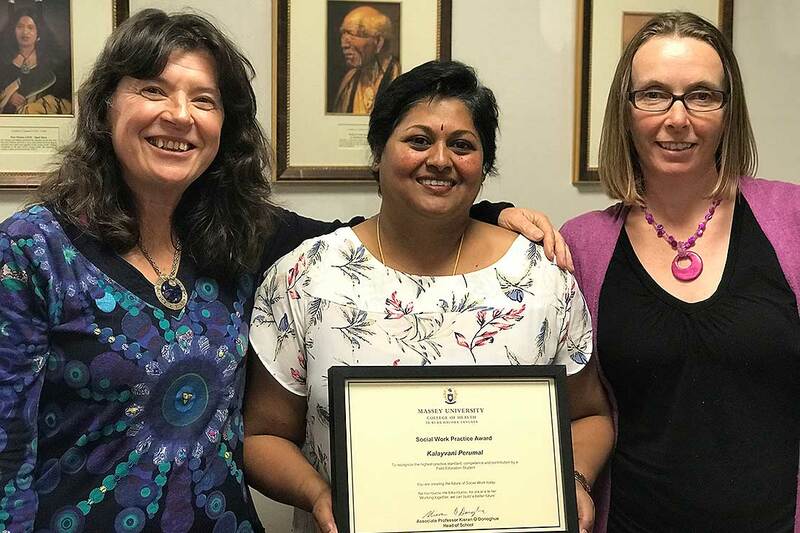 Kalayvani Perumal was awarded the Social Work Practice Award, in recognition of her high practice standard, competence and her contribution to the field. Nominations for this award were sought from field educators, external supervisors, placement agency staff and service users. Students were also able to self-nominate. Mrs Perumal was awarded $250.